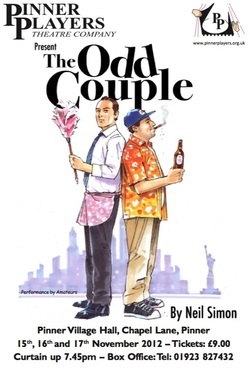 "Neil Simon’s award winning classic comedy, The Odd Couple, centres on the fastidious, clean freak Felix, whose wife has thrown him out, rooming with his divorced, easy going, untidy, “slob” of a friend Oscar. Set around the weekly card game with their four friends, the new relationship provides hilarious results, especially when the “coo coo” Pigeon sisters get involved. The play was made into a successful film starring Jack Lemon and Walter Matthau." "I can't take it anymore, Felix, I'm cracking up. Everything you do irritates me, and when you are not here, the things you're gonna do when you come in irritate me ..."